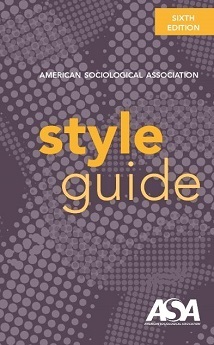 The sixth edition of the ASA Style Guide is the authoritative reference for writing, submitting, editing, and copyediting manuscripts for ASA journals and other publications following ASA's unique format. This revised, updated edition features guidelines for the most common situations encountered by authors and editors. New features include revisions to reference formatting and additional information on grammar, as well as expanded information on the use of electronic , digital, and social media sources. The sixth edition also includes guidance for online manuscript submissions, preprints, and updated reference examples. Coil binding. 163 pages, March 2019. 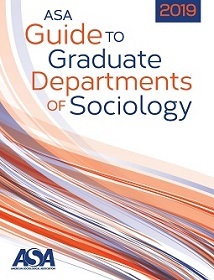 Get your copy of the 2019 edition of the ASA Guide to Graduate Departments of Sociology today! A best seller for many years, this invaluable reference has been published by the ASA since 1965 and provides comprehensive information for academic administrators, advisers, faculty, students, and a host of others seeking information on social science departments in the U.S., Canada, and abroad. The 2019 edition includes listings for 191 graduate departments of sociology. In addition to name and rank, faculty are identified by highest degree held, institution and date of degree, and areas of specialty interest. Special programs, tuition costs, types of financial aid, and student enrollment statistics are given for each department, along with a listing of recent PhDs with dissertation titles. Indexes of faculty, specialty programs, and PhDs awarded are provided. 408 pages; March 2019.